My main interest is making films about people. I'm not interested in cinematic art. If there is one director in Hollywood today that can be described as 'consistently unpredictable', it would have to be John Sayles, one of the best known independent filmmakers to come out of the United States. In a filmmaking career that has spanned two decades, Sayles has worked 'both sides of the fence' to finance his passion, working as a writer-for-hire for numerous mainstream releases (including "Apollo 13" and "Mimic") and then funneling his paychecks into his own productions. By maintaining his status as an independent auteur and producer, Sayles has been able to realize his unconventional narratives with a minimal amount of studio interference. With a passion for telling stories about the dynamics of people, politics, and communities, Sayles' filmography spans an eclectic mix of genres. "Return of the Secauscus Seven", Sayles' directorial debut, explored the lifestyle changes facing an ensemble of aging Sixties activitists, pre-dating the similarly-themed "The Big Chill" by five years. 1983's "Lianna" followed the turmoil faced by a married woman who undergoes a crisis of sexual identity. "The Brother From Another Planet", partially funded by Sayles' MacArthur Foundation 'genius grant', was a provocative and heavy-handed look at the underbelly of American society, featuring a young Joe Morton as a black alien dropped in the middle of Harlem. "Eight Men Out" and "Matewan" were two period dramas that examined the players' perspective of the 1919 Black Sox scandal and the effect of unionization on a West Virginia coal-mining town, respectively. Sayles' examination of community dynamics was further developed in 1991's "City of Hope", which intertwined several story threads to illustrate the fragile interdependencies in a New Jersey city. Sayles scored a mainstream coup in 1996 with the similarly-themed "Lone Star", which resulted in an Oscar nomination for his screenplay. However, instead of cashing in on his newfound success, Sayles followed up "Lone Star" with "Men with Guns". This non-mainstream-friendly film, in which most of the dialogue was in Spanish and various aboriginal tongues, explored the unexpected social turmoil caused by Western civilization and progress. 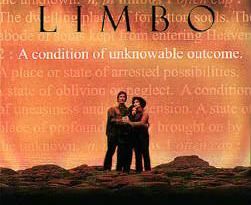 Now, in 1999, Sayles has once again bucked mainstream sensibilities with "Limbo", a drama that remains true to its thematic namesake, even to the detriment of its accessibility. The setting for "Limbo" is Alaska, America's 'last frontier', where the undisturbed tranquility of nature is juxtaposed against the numerous tourist-laden cruise ships that sail through its numerous inlets. It begins like many of the director's films, with a stream-of-consciousness narrative that catches little snippets of conversations during a wedding reception to paint a picture of Port Henry, Alaska. The town is populated with a number of strange characters, including a couple of lesbians that run the local tourist agency, a conniving bush pilot (Kris Kristofferson, who also appeared in "Lone Star"), and an old coot that fishes with a gun (Leo Burmester, also from "Lone Star"). He took them out on his fishing boat... got them killed. How would you like to carry that around with you? However, the story finds its center on three individuals who find themselves in a state of 'limbo', both with the community around them, and with their emotionally troubled lives. Joe Gastineau (David Strathairn of "A Midsummer Night's Dream") is a fisherman tormented by a tragic fishing accident that claimed the lives of two friends. Donna De Angelo (Mary Elizabeth Mastrantonio of "The Abyss") is a singer touring through Alaska, trying to escape a string of bad relationships. Finally, Noelle (Vanessa Martinez) is Donna's troubled teenage daughter, with a penchant for suicidal ideation and self-mutilation. Papa calls this place Limbo, because it's certainly not Heaven, and it's too cold to be Hell. At this point in the film, it appears that Sayles is about to illustrate the dynamics of the community through the relationships between his three principal characters, in a similar fashion to the theme-driven "Lone Star" and "City of Hope". However, remaining true to the title of the film, Sayles does the unexpected by shifting gears in the second half. After jettisoning all the minor characters from the first half of the film, Sayles enters thriller territory (similar to "The Edge") when he places his three principal characters in a life-and-death struggle amidst the wilderness after becoming stranded. By the middle winter, people are killing each other because they're bored. "Limbo" is a film that dwells on 'unexpected outcomes', and true to this thematic subtext, Sayles has deliberately structured his film in a most unexpected manner. Instead of relying on the conventions of 'normal' storytelling, Sayles toys with audience expectations, staying true to his intentions. Unfortunately, while some may applaud the writer/director to remaining steadfast in bucking traditional storytelling, he does sacrifice some mainstream accessibility with his unconventional narrative. Perhaps the most talked about aspect of the film is the 'twist ending', which is yet another unexpected outcome. While it remains true to Sayles' sense of thematic integrity, it has been reviled and derided by some for its abruptness and lack of closure. Another example would be the film's opening, in which precious screen-time is occupied by mildly interesting supporting characters and go-nowhere subplots. These narrative distractions are further heightened by Sayles' trademark slow pacing. Not surprisingly, "Limbo" has been described by many as 'unsatisfying' and 'pretentiously esoteric'. History is our future here, not our past. However, despite the unconventional narrative, Sayles manages to illuminate the various facets of his three main characters, as well as the relationships between them, through subtle snippets of dialogue. The most interesting moments of the film involve the complex interplay between Joe, Donna, and Noelle, and it is in the second half that "Limbo" becomes interesting. They are all in a state of emotional paralysis, fearful of looking forward because of what happened in the past-- limbo. How fitting it is that given their cheerless outlook on their own troubled lives, that they are collectively placed in circumstances where their very survival depends on possessing a positive viewpoint and a renewed sense of hope. "Limbo" is not Sayles' best work, but it is far from his worst. Although Sayles' attempt to maintain thematic integrity through manipulation of the film's form and function is an interesting concept, it is less effective than what he was able to accomplish in his superior "Lone Star". More conventionally minded audiences will probably find "Limbo" to be a frustrating and poorly paced effort. However, If you are a Sayles' fan, you might find "Limbo "interesting as an exercise to see how the writer/director has attempted to derail his own predictable and idiosyncratic style.